Eight years after chants of “the people want the fall of the regime” swept across North Africa and the Middle East, echoes of the same demand are making waves again in parts of the Arab region. In Sudan, “Tasqut bas” (Just fall) has been the rallying cry after protests against the spiralling costs of living in December escalated into ongoing rallies calling for long-time President Omar al-Bashir to step down. And in Algeria, hundreds of thousands of have been shouting “No to Bouteflika” since late February after the country’s ailing president announced his bid to seek a fifth term at elections scheduled for April. Bowing to the growing public pressure, Abdelaziz Bouteflika later dropped his plan to run again. But the 82-year-old also postponed the polls and has remained in office, angering the demonstrators who have continued taking to the streets en masse calling not just for his departure but the banishment of the entire ruling elite. Yet the protesters’ calls for political change are unlikely to to be on the agenda of this year’s Arab League summit taking place on Sunday in Tunis – much in the same way the regional body reacted to the so-called Arab Spring in 2011. According to Abdelwahab el-Affendi, a professor of politics at the Doha Institute, the Arab Spring has carved out three main camps within the League: the dominant, pro-US governments of countries such as Egypt, Saudi Arabia, Bahrain and the United Arab Emirates which saw the 2011 protests as a threat to stability; the pro-Iran bloc that includes Iraq, Syria and Lebanon’s Hezbollah movement; and those who have supported the changes brought about by the demonstrations, such as Tunisia and Qatar. “Almost all the regimes are anti-Arab, not merely for being beholden to foreign interests, but for being so viscerally hostile to their own peoples – and thus to the real Arabs,” el-Affendi said. 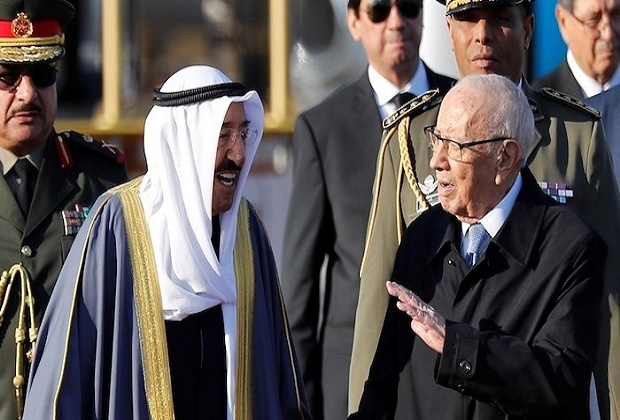 As a result, it is improbable that the Tunis summit will discuss the ongoing protest movements in Sudan and Algeria, especially in the absence of the two countries’ presidents, added el-Affendi, “except to express solidarity with the regimes”. Abdullah Alarian, a professor of history at Georgetown University, agreed, noting that the Tunis summit came against a backdrop of serious divisions, ongoing wars – including the four-year Saudi-UAE-led military campaign against Houthi rebels in Yemen – and, in some countries, increasing repression. “The combination of resurgent authoritarianism and destructive civil conflicts has ensured that the basic needs of populations across the region are being denied, largely due to the policies of the leaders meeting in Tunis,” he said. The popular uprisings of 2011, once a major source of hope for millions of disaffected Arab populations seeking change after decades of autocratic rule, have largely given way to counter-revolutions – and in the case of Syria and Libya to devastating wars. Tunisia, the host of the 30th Arab League summit, remains the only “success story” from those days, as the removal of its long-serving ruler has resulted in a functional democracy. Yet analysts said the Tunisia model was not something that leaders at the summit would be keen to emphasise on. For Sean Yom, assistant professor of political science at Temple University, the body’s summits represent nothing more than “a pageantry of attendees”. “The Arab League exists because it has to exist – that is, it’s harder to dismantle a regional organisation than create one,” he told Al Jazeera. “It is a byproduct of an era where there was a collective threat (Israel), and when certain issues, such as pan-Arab unity and Palestinian justice, actually had mobilising power among Arab masses. None of this is true anymore,” he added. Earlier in March, Tunisian Foreign Minister Khamies Jhinaoui said the readmission of Syria, which was suspended from the body in 2011 in response to President Bashar al-Assad’s brutal crackdown on pro-democracy protesters, would be on the summit’s agenda. However, a move last week by US President Donald Trump to officially recognise Israeli sovereignty over the Golan Heights, which Israel occupied from Syria in 1967, has overshadowed Damascus’s potential reinstatement. Arab and international condemnation was swift following Trump’s announcement, but analysts expect nothing more than verbal denunciations in Tunis – in line with the Arab League’s past practices. “The need to maintain a strong working relationship with the Trump administration is likely to take priority over any action,” Alarian said. Yom said that any official statement in Tunis condemning Trump’s decision would have have “no credibility”. “First, appeals to ‘international law’ will be laughable, given the ongoing interventions in Yemen and likely war crimes there, as well as the impotence of the Arab countries to halt the atrocities of Syria,” he said. While the US has controversially recognised Jerusalem as Israel’s capital and moved its embassy there, Saudi Arabia, a main Washington ally, has thrown its weight behind Trump’s son-in-law Jared Kushner’s Middle East peace process, known as the so-called “deal of the century”. Instead, the Arab League’s agenda is expected to stick to its usual talking points, such as giving lip service to the humanitarian crisis in Yemen without addressing the main aggressor, Saudi Arabia, and the influence of non-Arab countries in the region such as Iran and Turkey. The summit will also discuss the conflict in neighbouring Libya, after UN Secretary General Antonio Guterres attended on Saturday a meeting of the Quartet – the European Union, the African Union, the Arab League and the United Nations. No meaningful action, however, is expected. “It allows delegations to speak to one another through sidebar meetings,” he said. “The Kuwaitis, for instance, will likely try yet again to convince the Saudi and Qatari camps to dialogue.